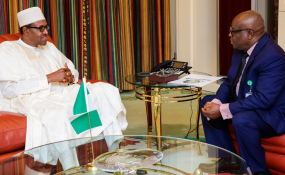 President Muhammadu Buhari with Chief Justice Walter Onnoghen at the State House last year. The United States Ambassador to Nigeria, Stuart Symington, has tasked the government and people of Nigeria to ensure a peaceful and credible general elections because "the world is interested and watching." "That election was credible; it lifted the country's standing internationally. Nigeria must build on that because its citizens are desirous of a peaceful and credible election. "All the candidates I have talked to, at all levels, have expressed the desire for a free, fair and credible elections, where all votes will count. "The forthcoming election is about Nigeria and by Nigerians. We must ensure free, fair, transparent and peaceful conduct resulting in a credible outcome. "Ultimately, every Nigerian is responsible under God, responsible under the law of the land, responsible to their conscience and in the court of public opinion, as well as in the eyes of the world. "If Nigeria is to find a path forward for every Nigerian, that path runs through freedom, through peace and credible elections to be decided by Nigerians," he said. "Truly, it's up to each person to make a decision and take responsibility for doing what is right," Mr Symington said. "I have always encouraged my supporters to promote peace in their conduct," he said.